It’s a grey, overcast day in Tokyo Japan and I’m spending the afternoon on the banks of the nearby Sumidagawa river, video taping the sights and sounds and weather along the river bank. Inspired by the dreary weather, I’m headed to the Etaibashi Bridge and the banks of the Sumidagawa to video tape the weather, boats and the passage of the river. Chatted (sort of) with an older gentleman who seems to have had the same idea as he too was video taping the river and river busses making their way from the Asakusa docks to Odaiba. Storm clouds are rolling in but I have my conbini umbrella to keep me (and the camera gear) dry. The sunset is doing pretty things to the clouds as twilight illuminates the river, followed by darkness, prompting the bridges and surrounding street lights to turn up. 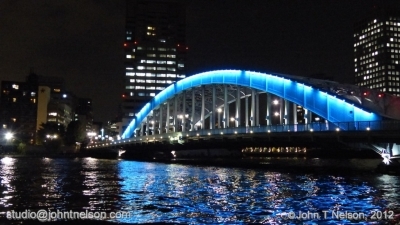 The Eitaibashi lights come on, turning the bridge a bright blue and reflecting lovely patterns in the water. The Tokyo water busses pass by up and down the river, their warm lanterns and lighting glowing like fireflies on the rippling waves of the river. It’s time for dinner and I try yet another restaurant on the Eitai Dori, this time Kagetsu Arashi, specializing in ramen noodles. This exotic foreign country feels more and more like home all the time. I’ve found that you can become attached and even grow to love any place and community, it just depends on what you put into it. I want to get to know these people better but language is still a barrier for me… and them. After dinner, I wander the streets and can feel the cold of Autumn and Winter approaching. 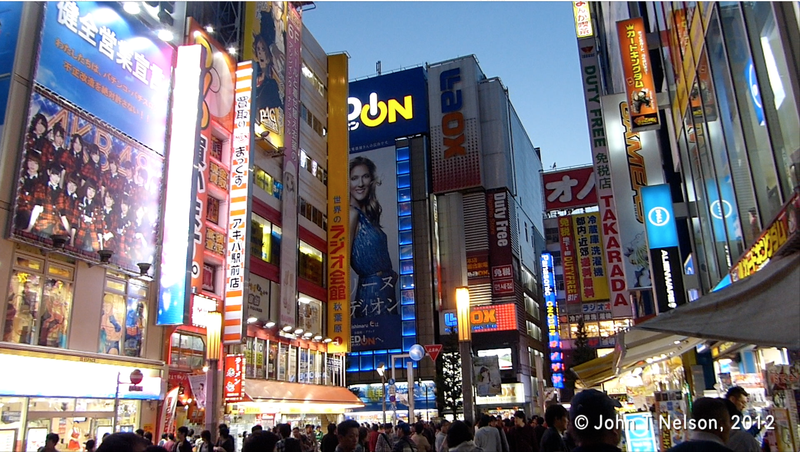 I definitely don’t like Japan in the Fall, give me the Japan of long summer days with heat and typhoons and starry nights and friends in every port! Christmas and New Years in Japan have their allure but these are times for family and community and not a wayfarer like me, one who isn’t fully integrated in the community, and how many years would that take? The full moon rises above the houses of Eitai Dori reminding us that this is Halloween night! I celebrate Halloween in the traditional manner… with seasonal donuts from Mister Donut. The Japanese decorate and seem to celebrate Halloween and Christmas in a similar manner to Americajin, but without the religious overtones. I notice that the Japanese also have a thing for pumpkins, perhaps they’re comfortable with the idea of a vegetable attaining an animus.